The Fifa World Cup trophy. 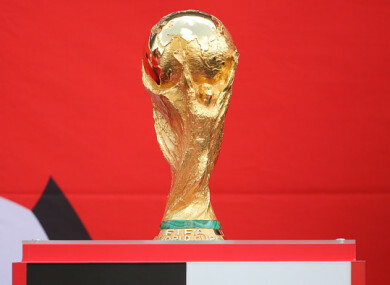 FIFA MEMBERS WILL decide on Wednesday whether the 2026 World Cup should be played in North America or return to Africa for just the second time, in Morocco. On the eve of the 2018 World Cup in Russia, 207 Fifa member nations will cast their vote in a congress of world football’s governing body. The report left the US-Canada-Mexico bid as the clear front-runner after giving it a rating of four out of a possible five. Morocco received only 2.7 out of five, but advanced despite red flags being raised over several critical components of the bid. On Monday, bid leader Carlos Cordeiro repeated a message he has hammered out again and again in recent months — vote on us, not Trump. “We believe strongly that this decision will be made on its merits,” Cordeiro said. The US lost out to Qatar in 2022 in a vote now tarnished by corruption allegations which spelled the beginning of the end of the once all-powerful Fifa president Sepp Blatter. Critics of the Morocco bid also point to the fact that the 2026 World Cup will be the first to be expanded to 48 teams, posing a severe test for the hosts. But the north Africans are still considered to be in with a genuine chance. It has tried, and failed, four times before, in votes for the 1994, 1998, 2006 and 2010 tournaments — it lost out in the latter to South Africa, the only African nation ever to have hosted football’s global showpiece. Quiz: How much do you know about the 2018 World Cup? Email “Tomorrow Fifa will choose between North America and Morocco to host 2026 World Cup”. Feedback on “Tomorrow Fifa will choose between North America and Morocco to host 2026 World Cup”.